The year is 1876. In the small Sierra Nevada settlement of Lost Pine, the town witch, Emily Edwards, is being run out of business by an influx of mail-order patent magics. Attempting to solve her problem with a love spell, Emily only makes things worse. But before she can undo the damage, an enchanted artifact falls into her possession—and suddenly Emily must flee for her life, pursued by evil warlocks who want the object for themselves. Dreadnought Stanton, a warlock from New York City whose personality is as pompous and abrasive as his name, has been exiled to Lost Pine for mysterious reasons. Now he finds himself involuntarily allied with Emily in a race against time—and across the United States by horse, train, and biomechanical flying machine—in quest of the great Professor Mirabilis, who alone can unlock the secret of the coveted artifact. But along the way, Emily and Stanton will be forced to contend with the most powerful and unpredictable magic of all—the magic of the human heart. Imagine a world where magic, instead of science, ruled and that it kick-started and fueled the industrial revolution. A world where rampaging mutated animals threaten the landscape and the people who lived there and where witches and warlocks are the masters behind spells that cause mayhem as well as a place of sanctuary. This is the world where The Native Star takes place. Within the first few pages of this book, I got well and truly sucked in, and I could not put it down because it was such a fantastic and imaginative joyride of a read! Emily Edwards is a herbal witch whose magic is based on natural elements and herbs. Due to increasing competition from a mail order Hex company, she is forced to take drastic action so that she can support her ailing father. However, this plan goes horribly wrong when a travelling Warlock called Dreadnought Stanton finds out she miscasts a love spell to the richest man in her town so she can secure her family’s well-being. Emily and Stanton have had several run ins previously, and both find each other’s attitudes to magic as polar opposites – as well as their personalities. But Emily and Stanton soon find themselves in deeper trouble. After investigating zombie miners who have gotten loose, Emily, while battling them, somehow gets her hand infused with a mysterious magical stone that was unearthed in the mines. Stanton — who realises the stone is a Native star and is a source of untempered magic — offers Emily the help to get out of her predicament as she cannot cast spells. But they both find themselves on the run as dark magical groups are after the stone for their own agenda. I loved the fact that there was a character called Dreadnought Stanton! That name alone for a hero would have perked my interest in a book, and like what the name implies, Dreadnought is a stickler for propriety and is very straight laced which annoys Emily to no end as she is the polar opposite to Stanton. Downstairs by seven, Emily mouthed in a snotty voice as she let herself into her room. The world-building was so well thought out with each different type of magic having their own rules and precepts which I really liked. It made the premise really well structured but also full of imagination, and I loved how different types of magic would interact with people and the environment. M.K Hobson also has a great eye for historical detail, from the rich language to the setting. It really felt like I were ensconce in post civil war America, but with magic! There different types of magic, such as the mass produced Hex’s by Bough’s Patent Magicks, which is mail ordered spells and hexes. Then you have the more natural magic that Emily practices which added to the tapestry of different types of magic in the world-building. There were also elements of steampunk, such as a biochemical flying machines which Emily and Stanton use to escape from their enemies that was a very fun and awesome scene. The Native Star also had a cast of memorable characters who were very well drawn out, from Emily and Stanton’s quirky and eccentric family and friends, to the creepy villains who just added to the rich tone and atmosphere of the book. There were also a few surprises and twists that I did not expect but they helped drive the plot to a great pace and ending in the book. I can’t say enough good things about this book. For me it’s definitely one of the best debuts I have read this year, and I absolutely adore the characters and the setting. 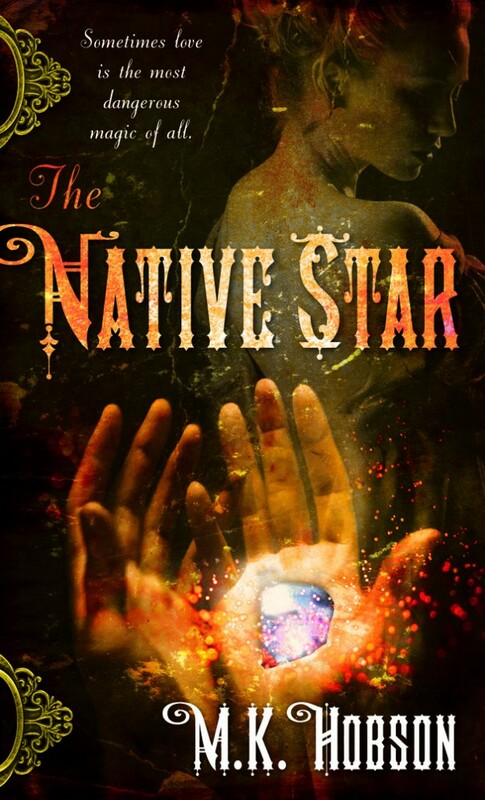 If you are fan of Gail Carriger and Leanna Renee Hieber, then you will enjoy The Native Star as it shares similar elements with these authors books. Emily and Stanton’s romance was a joy to read, and although it had a slow buildup and it may not be as steamy as other romances, their snarky dialogue sparkles off each other and adds to their great chemistry. But for me it was a unique take on Fantasy Romance with engaging, memorable characters, humour and spades of imagination! I cannot wait for the sequel, The Hidden Goddess, which will be released next year. But go and pick up this book! You wont regret it! Wonderful review hon and I really want this book now. You told me so many good things about it that I’m now highly intrigued.